A beautiful smile is all about confidence, but it’s almost impossible to feel good about the way you look if you have stained, chipped, cracked, gapped, or misaligned teeth. With our cosmetic services, we can eliminate any dental flaws you might have and give you a smile truly fit for the silver screen. With your own personalized treatment plan, our dentists will help you achieve a beautiful look that's perfect for you. If you’re ready to get the smile you’ve always wanted, please contact us today for consultation. Are you an adult who would love to straighten your crooked, crowded, or gapped teeth, but you can’t imagine going to work or seeing friends with a mouthful of metal braces? If so, you could benefit from using Invisalign. 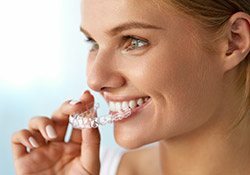 Rather than relying on brackets and wires, Invisalign utilizes a series of custom-made clear plastic aligner trays to gently straighten the teeth. All a patient has to do is wear each one as directed in order to achieve their desired orthodontic improvements. It’s that simple! Adult patients love Invisalign because the trays themselves are practically invisible on the teeth, meaning they can smile confidently during treatment knowing no one will notice them. Plus, the trays are easily removable, so they can be taken off whenever a person needs to eat or brush their teeth. With Invisalign, you can get the straighter smile you’ve always wanted in the most discreet, comfortable, and effective way possible. When one of your front teeth has become damaged, a noticeably unnatural crown isn't your only option. For these particular teeth, our dentists can use a more elegant and natural-looking solution. With Emax all-porcelain crowns, we'll give you a tooth that blends in seamlessly with your other teeth and is strong enough to bite into an apple. With this solution, it won’t feel like you’ve gotten your tooth repaired—it will feel like you’ve gotten your original tooth back! Are your teeth looking a bit dull and discolored? Everyday factors like coffee, wine, tobacco, aging, and even genetics can leave your smile not looking its brightest. 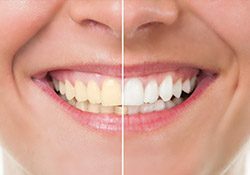 Thankfully, professional teeth whitening treatments are able to quickly and effectively turn back the clock and give patients a stunningly white smile again. If you’re looking to achieve lightning-fast results, we can give you a fast in-office treatment using the Opalescence Boost System. However, if you’d prefer to whiten in the comfort of your own home, custom-made kits are available as well. These kits are stronger and safer than anything you’ll find on store shelves or at the local pharmacy. 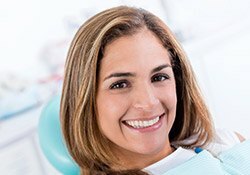 When you come in for your six month checkup and cleaning, don’t forget to ask us about our Whitening for Life program! 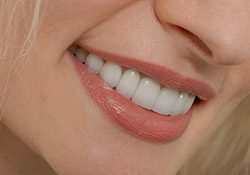 Veneers are extremely thin ceramic coverings that are bonded to the front of the teeth, and they can give you everything from a minor touch-up to a complete smile makeover. 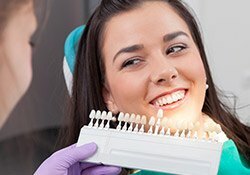 Do you have small chips, cracks, or gaps in your smile that throw off its entire look? To get rid of these annoying issues, we have a fast and effective treatment called direct bonding. Your dentist will apply a specially shaded composite resin to your tooth and use it to literally sculpt an addition that's the perfect shape and size to hide the imperfection. After getting your approval and hardening it with a curing light, you’re done! This treatment is so easy that it doesn’t require any anesthetic and can often be completed in less than an hour.